With a capacitive touch keypad and one of the largest LCD readouts in the industry, Eclipse precision balances provide high-performance scientific weighing for lab professionals. Eclipse balances feature a compact footprint that occupies minimal space on the lab bench yet offers a wide array of features including advanced density determination, percentage weighing, checkweighing and dynamic weighing capabilities. The balance has a single-piece construction that allows greater stability whilst weighing, enabling highly repeatable results. Containing fewer parts than a traditional force motor balance, the weighing sensor features an optimised internal mechanism, helping the Eclipse tolerate rigorous laboratory use. 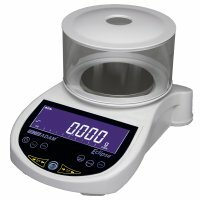 Eclipse precision balances are designed for use in laboratory environments. These balances include a built-in dynamic weighing function that is particularly helpful in weighing and analysing chemicals. The stainless steel top pan is also chemical resistant. Eclipse precision balances feature all the necessary capabilities for cosmetic testing laboratories. The percentage weighing function can accurately weigh individual ingredients used in soaps, candles, skin creams and other cosmetics to ensure they have the correct balance of each ingredient.